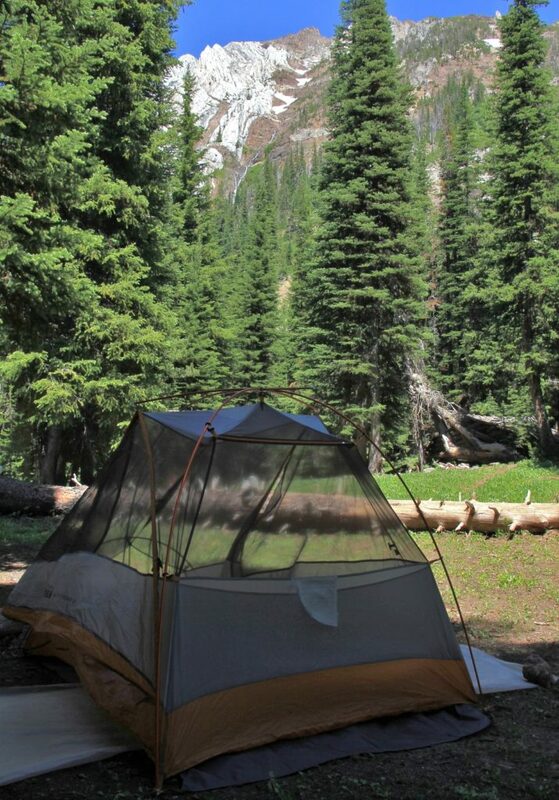 “The Eagle Cap never disappoints” we exclaim each and every time we hike in the northeastern Oregon wilderness. 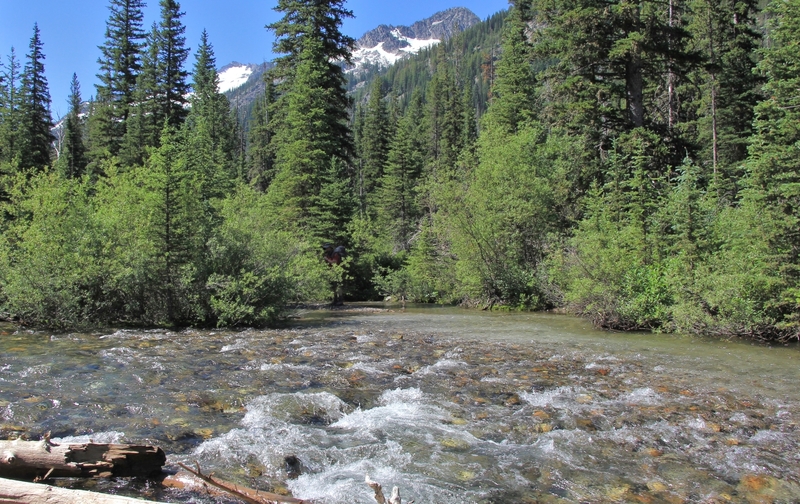 The area is just two hours from our home in southeast Washington and it is impossible to beat. 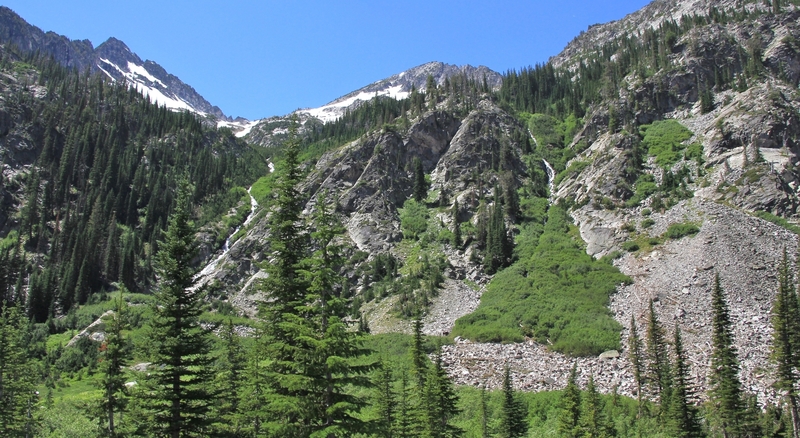 By early July, much of the wilderness can still covered in snow, making the alpine lakes a little questionable for access. But for those wanting an early start, Hurricane Creek proves itself more than worthy of your efforts. 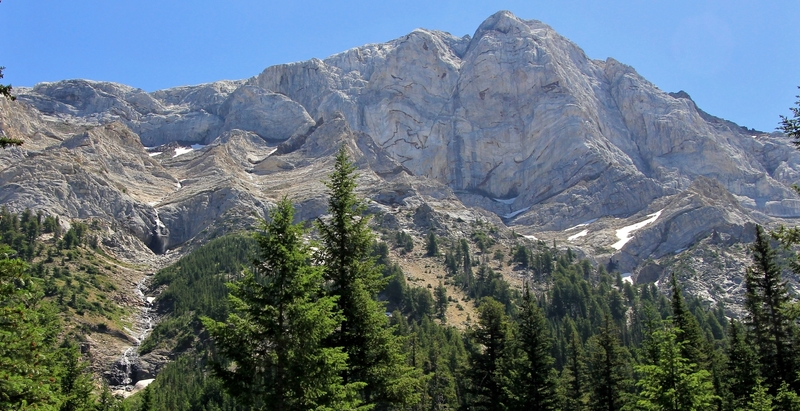 Congress designated the Eagle Cap Wilderness in 1964. 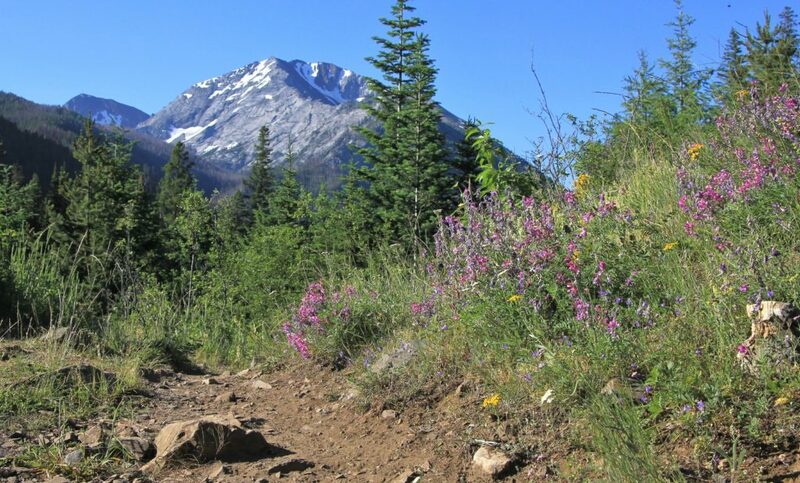 At 355,548 acres, it is Oregon’s largest wilderness as well as its largest continuous alpine area. 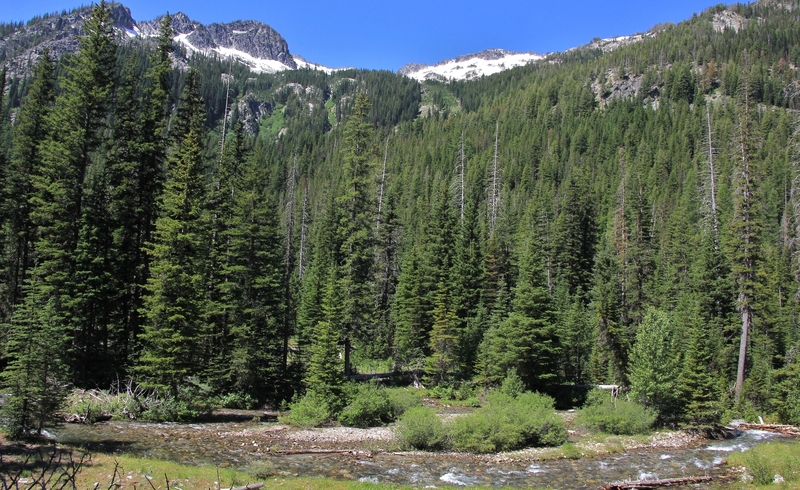 This area is part of the vast ancestral homelands of the Nez Perce Indians and is still home to deer, elk, mountain goats, bighorn sheep, black bears, mountain lions, and wolves. 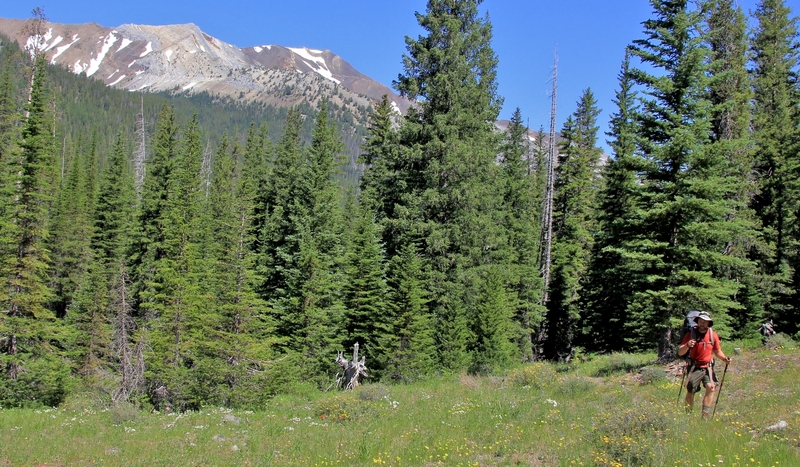 Thirty-one summits exceed 8,000′ elevation with Sacajawea Peak towering over them all at 9,845′. 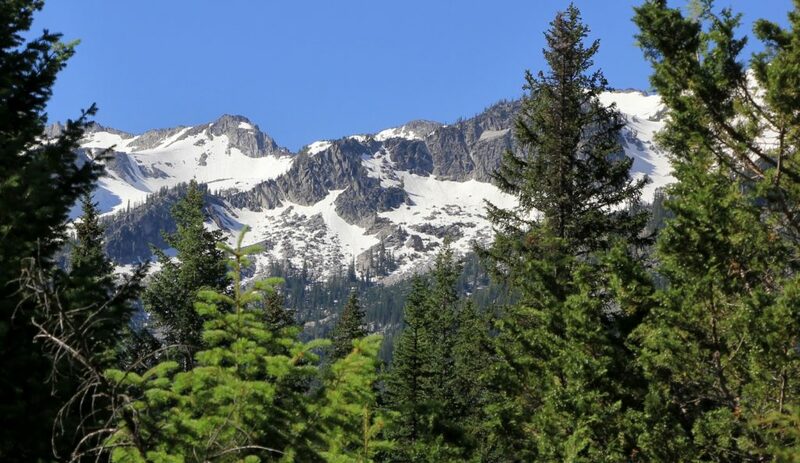 The alpine wilderness is dotted with 60 high alpine lakes, many of which are surrounded by stunning granite peaks and flow into wildflower filled glacial valleys. After years of backpacking many of the 534 miles of trails in the wilderness, we find ourselves repeating that phrase, “the Eagle Cap never disappoints!” Early July 2017 we once again proved this statement true. What we thought would be a relatively dull backpack since our hike didn’t have a real destination, proved to be yet another feast for the eyes. Wanting to beat the heat with an early start Saturday morning, we took off straight from work on Friday with the goal of staying some place within an hour’s drive of the Hurricane Creek Trailhead. Not far south of the Chico Trailhead along OR-3 we found a great at-large spot in the trees along the breaks of Joseph Creek Canyon. We had a flat, grassy area for our tent and no one was around. Saturday morning we made the short drive down to Enterprise and then to the trailhead where we found only three other cars. Sweet! 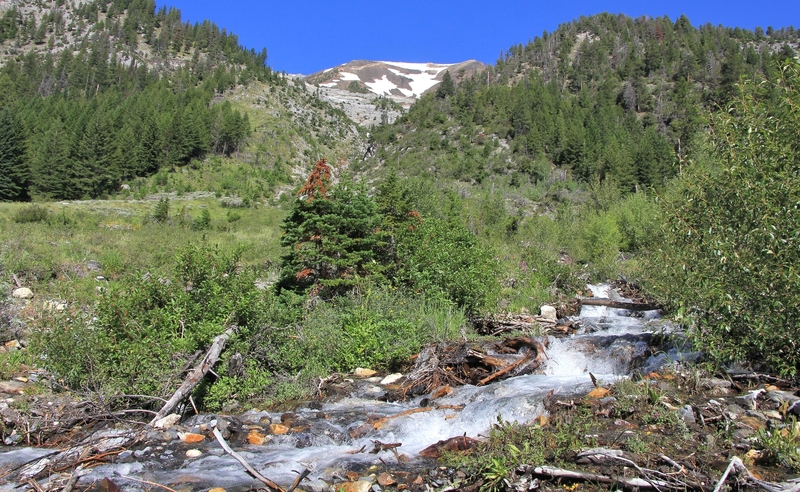 Click here for a Forest Service informational sheet and map for Hurricane Creek Trail. 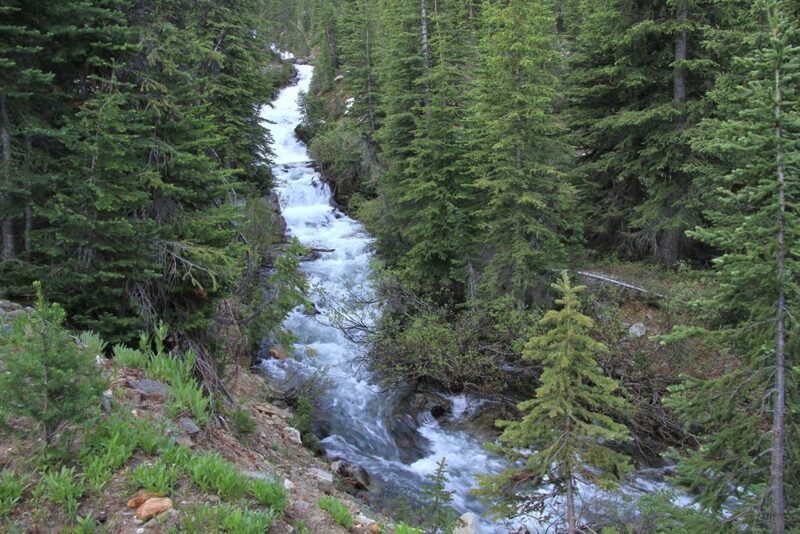 We started off in lush forest and quickly came to the crossing of Falls Creek which I read could be a little tricky during snow melt. 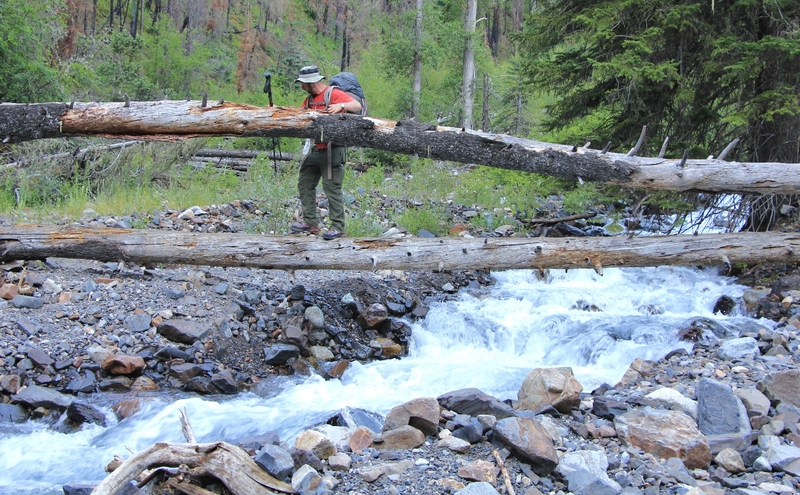 A couple of moderate sized trees had fallen across the river and we were able to cross on those. We continued along, alternating between areas of forest and then open meadows where we’d get glimpses of snow covered mountains in the distance. We did go through a few areas that burned a couple years ago in the Hurricane Creek fire, but we never felt like we were in a big burn area. Soon enough, we left all signs of the fire behind us. At 1.6 miles we came to Deadman Creek. It would have been hard to keep dry feet here. It was already a warm morning, so I didn’t care and walked straight through it. 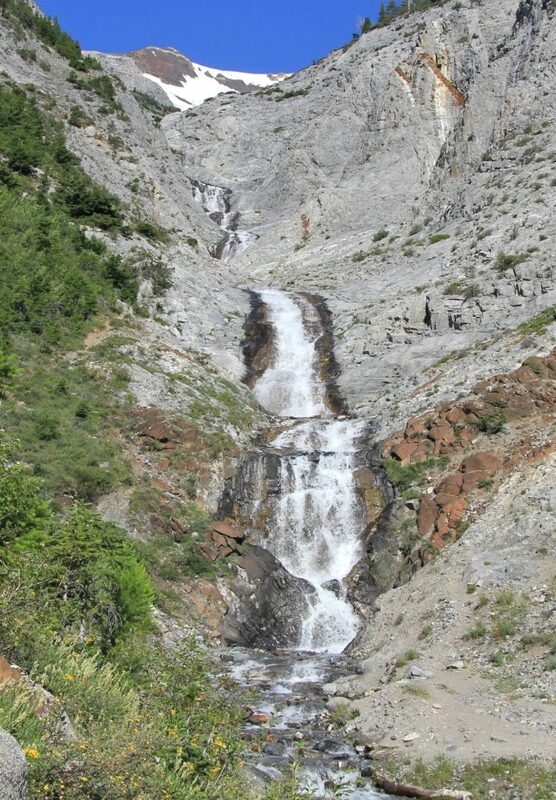 This was a beautiful area with multiple waterfalls coming down from the snow-covered peaks. 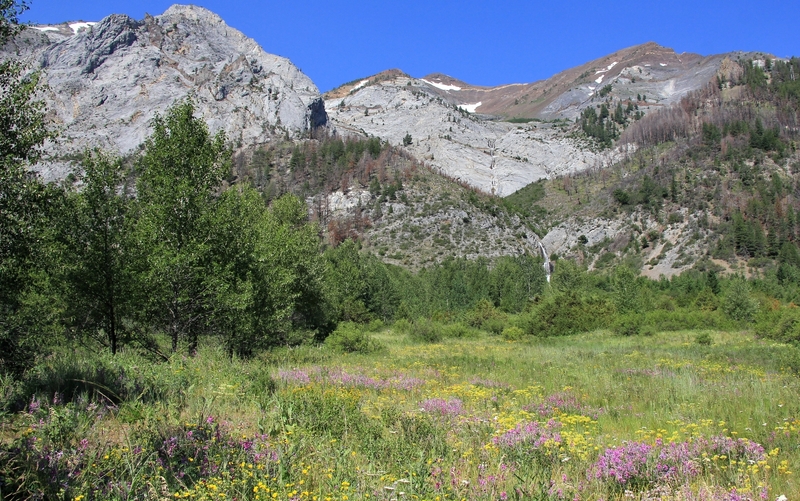 As if waterfalls weren’t enough, the meadow was full of colorful wildflowers in peak bloom. Throughout the hike we saw columbines, paintbrush, aster, fireweed, penstemon, bluebell, scarlet gilia, and many more that I couldn’t identify. Views dramatically improved as we continued up the canyon. 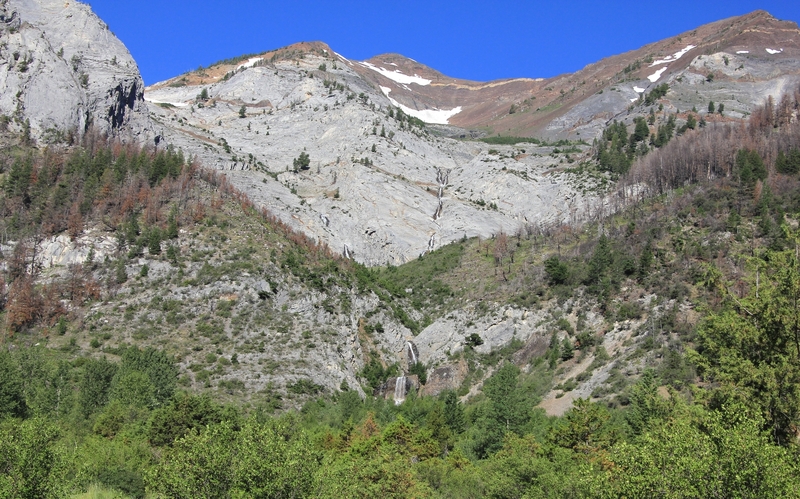 At 3.0 miles we reached Slick Rock Canyon, one of the highlights of the trail. 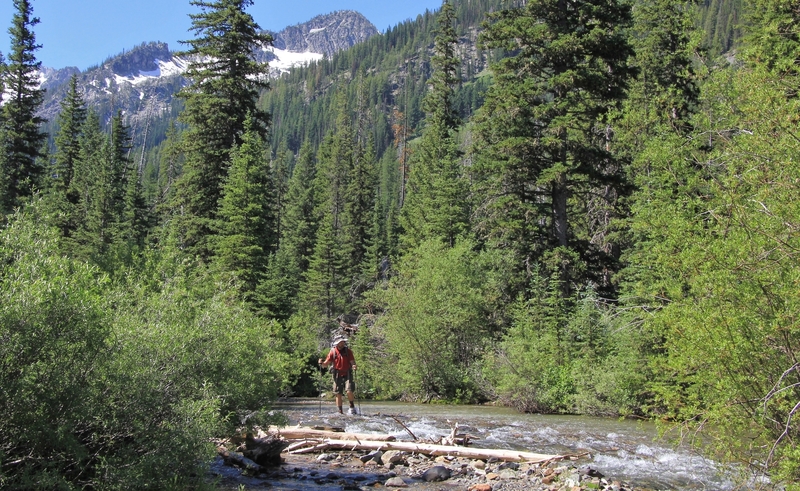 At about four miles we crossed Granite Creek. Like Deadman, this was a beautiful opening with magnificent views of waterfalls up to the snowy peaks. 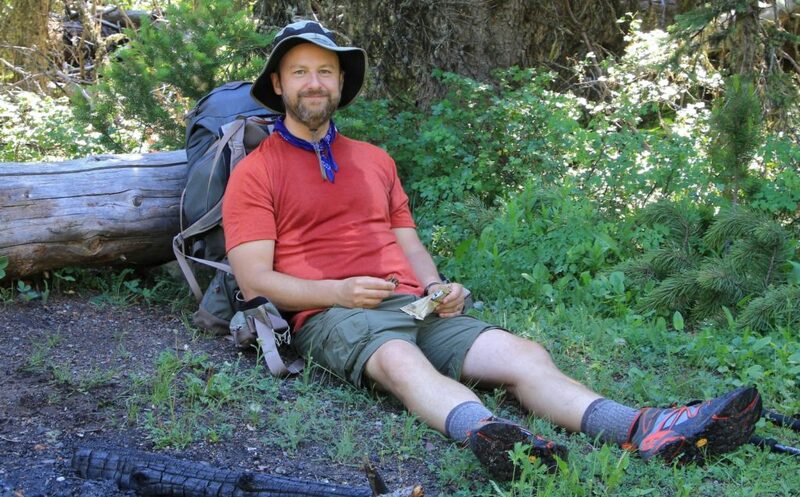 At just shy of five miles, we took a break at a small campsite in the shade along the creek. Just past that, we came to an interesting campsite that was surrounded by the creek on three sides. This would make a great place to camp on a hot day. There was another nice campsite a short distance further just before the crossing of Hurricane Creek. At around the five mile mark, we came to our crossing of Hurricane Creek. I had been wondering if this would stop our journey. How deep and swift would the crossing be with all the run off? I had called the ranger station earlier in the week and they’d had a report from a woman who said it was thigh deep. At first glance, it did look deep. But we scouted a bit and managed to find a route that was just below our knees. We crossed to an island and then across to the far side. The stream was relatively wide here and we were in ice cold water for several minutes. By the time we reached the far side my toes ached from the cold. Walking was a little slow for the next few minutes, but we were successfully across and continuing on! Views of the snow-covered peaks around us continued to improve and now we were getting great views of the Matterhorn towering above us. The trail had only been cleared to the creek crossing, so we started having an occasional blow down to navigate over/around, but none posed a serious obstacle. At seven miles we started seeing occasional patches of snow. Not far after that, we spoke with a hiker who had made it about ten miles in. 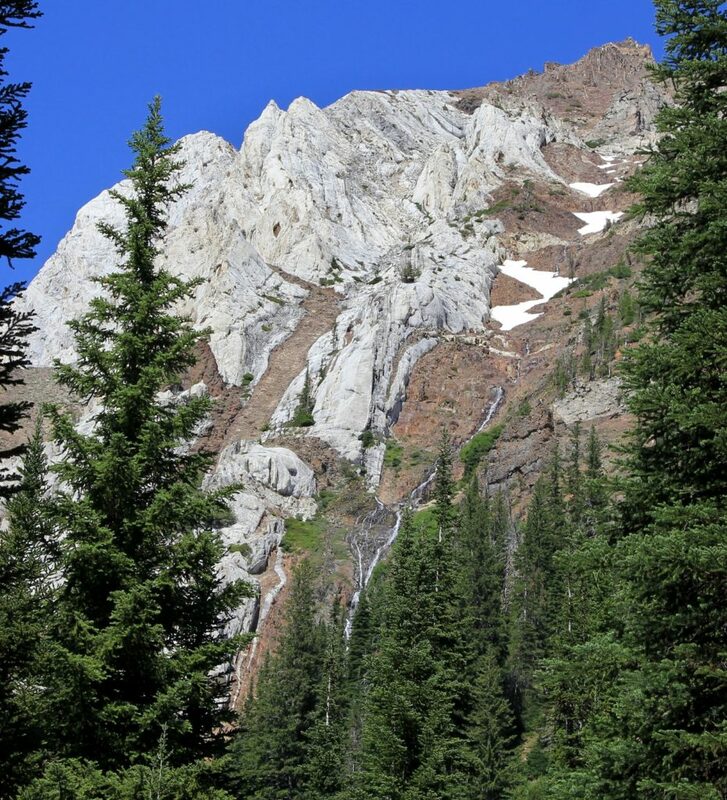 His goal had been the Lakes Basin, but the snow got so deep that he lost the trail and had to turn back. 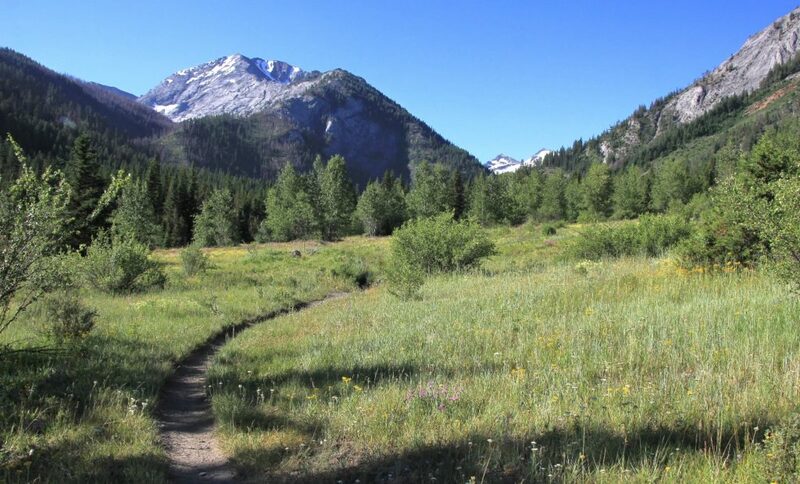 He reported that there were lots of nice meadows between eight and ten miles, but that they were pretty wet and swampy with the melt off. At just shy of eight miles, we could see Hurricane Creek coming down over a large cascade. The trail left the creek and began climbing up the hillside. 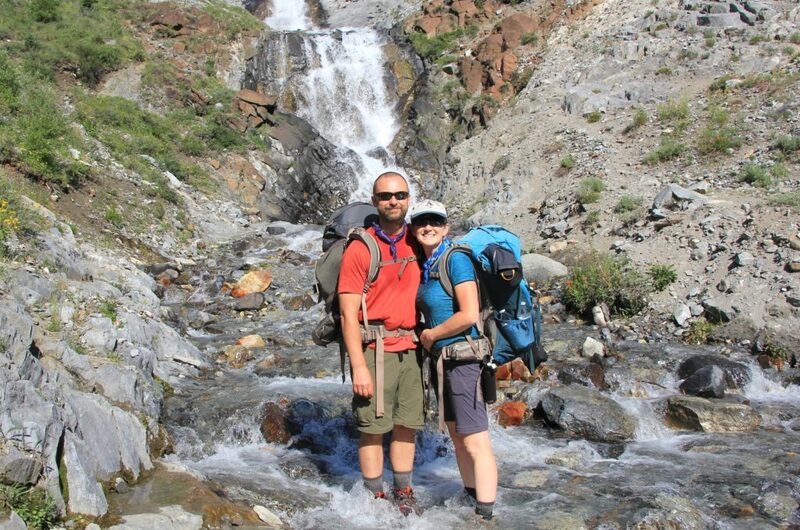 We got some great views of the Matterhorn and another lovely waterfall here. 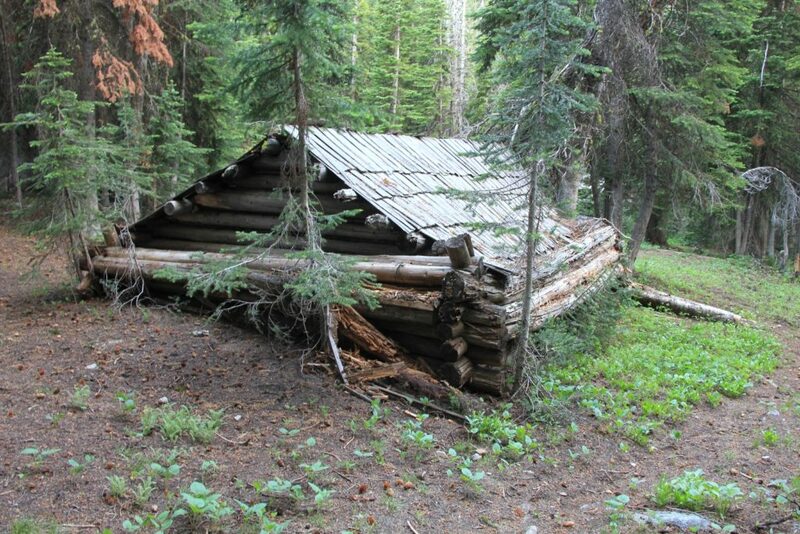 At 8.25 miles we came to the old cabins we’re heard about. I thought they would be in a meadow area so I was surprised when we came to them in a relatively heavy wooded area. We found a nice flat camp site next to the standing cabin where we had fantastic views of the Matterhorn above us and Hurricane Creek thundering down the canyon to our side. That afternoon we had our usual routine of setting up camp, filtering water, Jason napping, my reading, and overall relaxation in a beautiful location. Temperatures were warm in the sun at 84 degrees, so I mostly hid out in the shade and tried to hide from the biting flies. As we lay in our tent reading that night, I stared up at the Matterhorn which was just visible in the last bits of dusk. I could barely make them out, but two mountain goats were scaling the rocks high above us. I was awake for a couple of hours in the middle of the night watching the Matterhorn illuminated by the full moon. We had a relatively mild temperature of 46 when we awoke at first light. Unfortunately, our morning began with the realization that someone (me) forgot to pack coffee. Ugh, what a disappointment! I had also forgot my Keens. This was not a good trip for creature comforts! We had our breakfast, packed up camp, and hit the trail at about 6:15. After the warm day yesterday, it was nice to hike in the cool morning temperatures. We had a lovely hike out. The crossing at Hurricane seemed a little lower than the previous day, no doubt due to the decreased runoff overnight. Over the first five miles, we only passed four small parties. At Slick Rock we passed a young couple backpacking in. 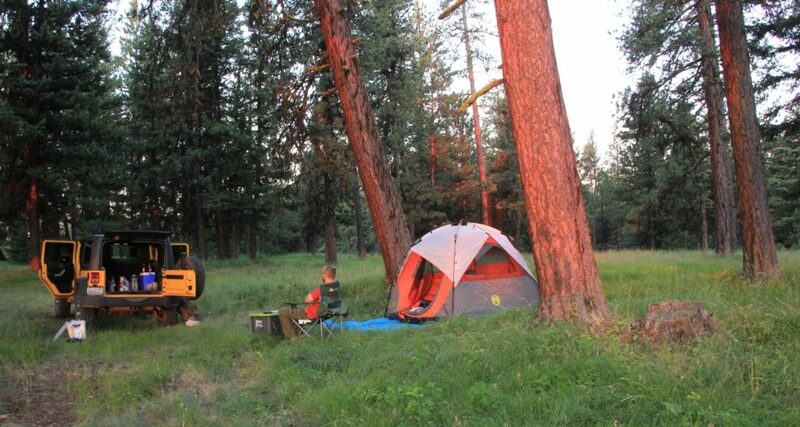 They asked some questions about campsites, trail conditions, and the crossing of Hurricane. Like I had been, they were concerned with the Hurricane crossing and were relieved for our tips on where to cross. In our last three miles, we passed maybe a dozen groups of day hikers. Back at the trailhead, we found a packed parking lot. 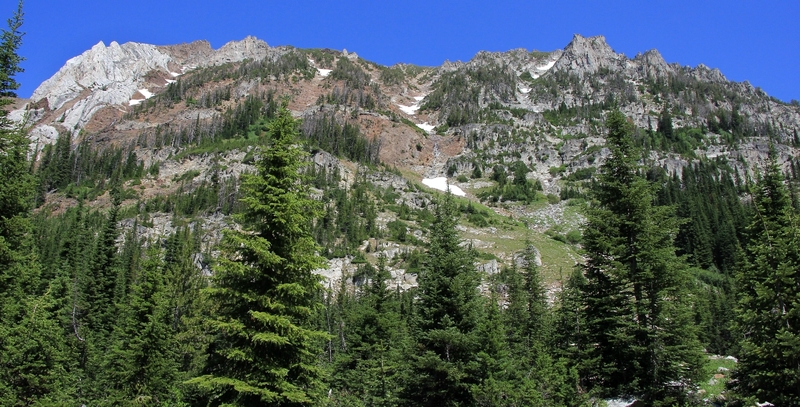 This is a popular day hike, but I highly recommend doing it as a backpack. The scenery is better the further in you get. We finished our hike at 16.5 miles roundtrip . 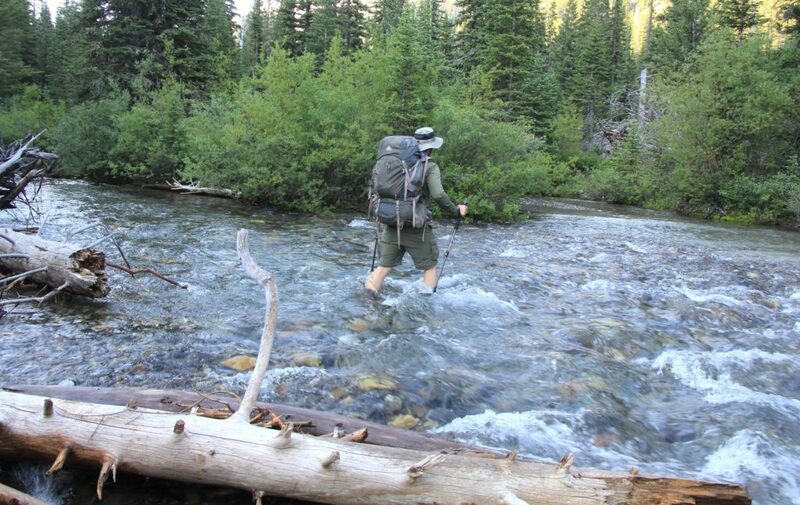 We had about a dozen stream crossings each direction. Most of these we were able to hop across dry footed, but there were 3-4 that were wet crossings. The large winter snow pack and cold wet spring made for lingering snow in the mountains. 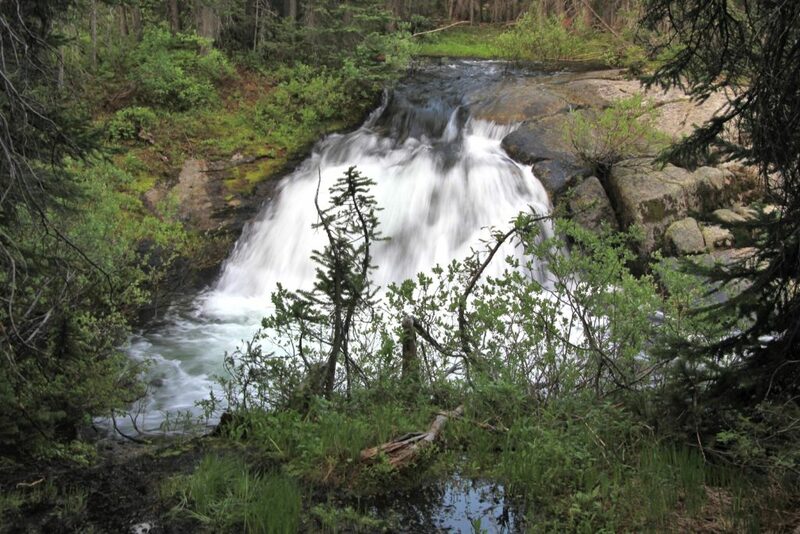 July had really heated up and we enjoyed many spectacular waterfalls due to the late melt. We had a couple places where seasonal streams flowed down the middle of the trail, but overall the trail conditions were great. While we climbed a total of 2,000′ in elevation, the climb was overall very gradual. Best of all, we enjoyed relative solitude except for the last three miles of day two. Back at the Jeep, we changed into Keens, grabbed a cold drink, and headed for Joseph. We thought we were too early for Embers to be open, but we caught them right at opening. 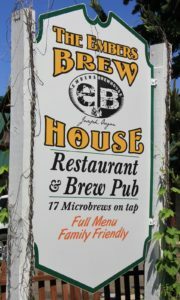 We enjoy this brew pub for their outdoor seating with views of the Eagle Cap. I highly recommend their calzones which are certainly more than I can eat—even with a backpackers appetite! Jason, of course, recommends a cold beer. Directions to Hurricane Creek Trailhead: From Highway 82 in Enterprise, take a right at the junction of Highway 82 and Hurricane Creek Road at the south end of town. 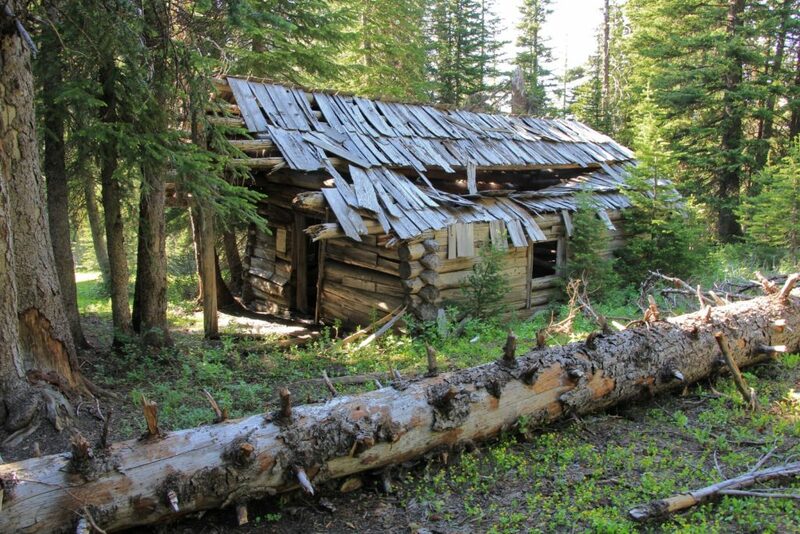 Drive approximately 5 miles south of Enterprise to the corner of the Hurricane Creek Grange, then proceed straight ahead on County Road 521 and Forest Road 8205 five miles to the trailhead. 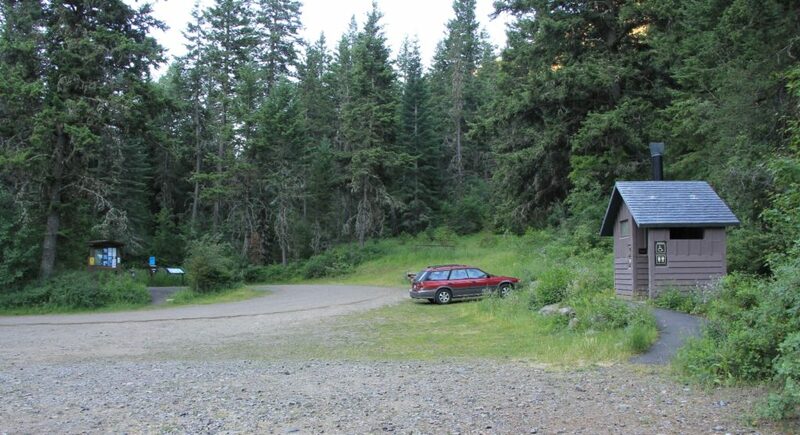 A Northwest Forest Pass required to park at trailhead. 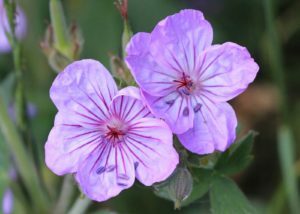 Another beautify blog Lusha. Of course it helps to have such beautiful scenery to show off. Question, how do you do the wet crossings? Do you walk afterwards with wet feet? As always, thanks for being our biggest fan!